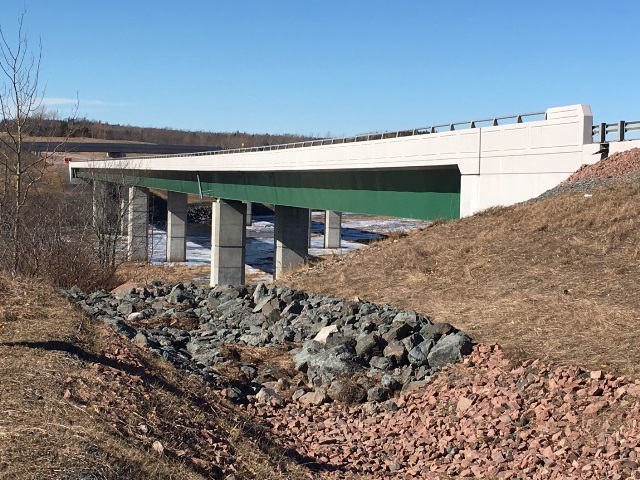 The two new structures crossing the South River are long multi-span, continuous, twin, trapezoidal steel box girders with total spans of 309 m for the Eastbound structure and 328 m for the Westbound structure. The South River Bridges represent the longest girder spans in the province and carry a combined capital investment of nearly $32.8 M. Each structure consists of four continuous spans with exterior spans of 71.5 m and interior spans of 92.5 m (Westbound structure) and 83 m (Eastbound structure). In addition to the design of the twin structures, HEC is also responsible for the girder erection working for the steel fabricator. Due to significant site constraints, HEC has designed an innovative girder erection method involving the use of a launch nose (previously designed by HEC and used by the client on other projects) and a temporary cable stayed / tower system mounted to each girder to facilitate the launch of the structure across spans as long as 92.5 m. This method limits the use of large cranes positioned within the marsh below and eliminates the need for temporary bents to limit the length of the leading cantilever. 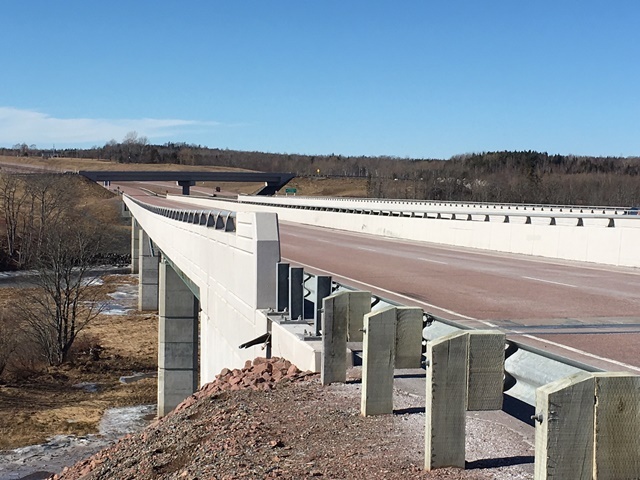 The cable stayed system significantly lowers cantilever tip deflections and girder stresses during launch eliminating the need for significant modifications to the parent girder designs while allowing the girders to cantilever from pier to pier without the need for expensive temporary bents. HEC analysed the strength and stability during all launching phases, completed the required girder modification designs, designed all launching components (including launching nosing, nosing connection, cable stayed tower, pier jacking supports, approach jacking supports and lateral restrainers) and prepared detailed phasing drawings to be utilized by the contractor on site.